About Couscous description and history of the couscous pasta - "granular semolina"
Couscousier - the special pot for cooking couscous; what it looks like, how you use it; the best kind to buy. Preparing Couscous in a couscousier; alternative method without a couscousier; instant couscous. Chicken Couscous with carrots, zucchini, turnips, and chickpeas from "Arab Bites"
Tunisian Couscous with chicken, fish, or lamb, potatoes, carrots, cabbage, onion, and chick-peas, and spiced with cayenne. Couscous à la viande Tunisien Recettes Tunisiennes en français. Sahdia's Tunisian Couscous with lamb, potato, turnip and carrots, and artichoke stems. 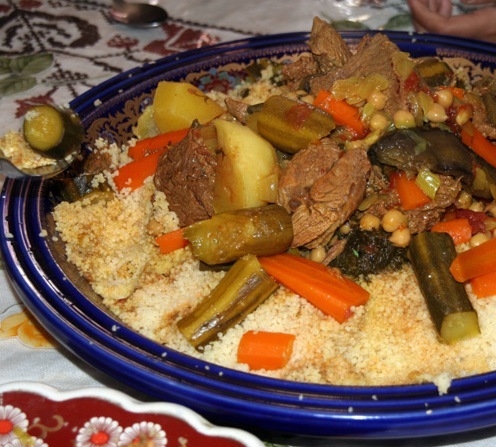 African Lamb Couscous from Mauritania includes turnip, carrots, potatoes, cabbage, tomato, and pumpkin. Paula Wolfert's Harissa with Roasted Red Pepper, Ancho, Guajillo, and Chipotle Peppers, dried New Mexico Green Chiles, Garlic, Coriander, Caraway and Olive Oil; great on fish. Ras al Hanout Greg Malouf's recipe for Moroccan spice mixture: coriander, cumin, paprika, peppercorns, cinnamon, cardamom, cayenne, and more. Maasems "Fatima's Little Fingers" - eggs, chicken, cheese wrapped and fried.